The appartements in eighteenth-century interiors were organized hierarchically to differentiate between ceremonial, social, and private spaces. This hierarchy was reinforced through increasingly elaborate decoration as the designation for spaces grew more public. With this in mind, the decoration adorning the paneling, or boiserie, would have made guests aware of the types of social interactions which were acceptable and expected within a particular space. In some cases, the decoration carved into the paneling acted as an overt symbol of the room’s purpose. 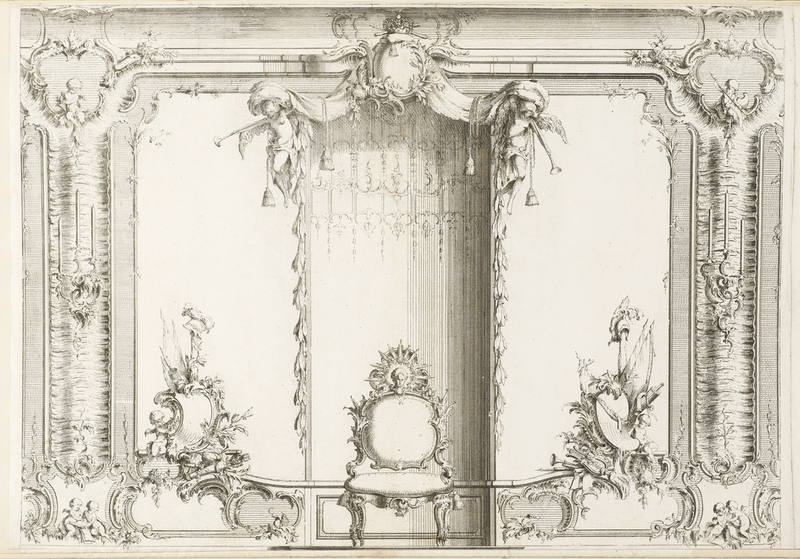 Knowing of the planned hierarchical organization of the decorative schemes, Johann Michael Hoppenhaupt II’s Design for Interior Wall Decoration with Chair (1753), with its incredibly grand design, clearly represents an extremely public space. The print presents an elaborately decorated chair placed within the center of a niche. In this case the niche, placed centrally in the symmetrical plan, acts as a frame for the chair and is itself highly decorated. At its height the boiserie displays a crown, which is flanked just underneath by elegantly slender putti and their trumpets. Angled downward it is as if the putti are announcing the grandeur of the chair Hoppenhaupt has designed and the person who is meant to sit in it, possibly Frederick the Great, King of Prussia. Everything about this interior design exudes triumph and authority; on either side of the niche there are references to war and hunting, exemplified by representations of helmets and a quiver of arrows. All of these elements further highlight the chair and its sitter. The chair, though singular in its ornament, reiterates the power and authority of the other imagery; the back of the chair portrays a figure encircled by a radiant design, likely a reference to the sun god Apollo. Apollo had been employed for centuries as a decorative motif to portray a ruler’s absolute control of the everyday life of those he governed. Receiving people within this space, on this throne-like chair with crown overhead, would have communicated to anyone present that this man or king was the master of his universe. Julia Pelkofsky is a Master’s Fellow in the Department of Drawings, Prints & Graphic Design at Cooper Hewitt, Smithsonian Design Museum. She is currently working on her MA in the History of Decorative Arts and Design at Parsons, the New School for Design. Print, Design for Interior Wall Decoration with Chair, 1753. etching and engraving on white laid paper tipped into cream laid paper. Purchased for the Museum by the Advisory Council. 1921-6-221-7.